Grant Brown should soon be made Lincoln Assistant manager on a full time basis after his own former assistant Damian Froggatt was named as the new head of youth at Sincil Bank. Our record appearance holder left the field of play after 447 appearances in all competitions to join the youth set up and then become our caretaker manager on three occasions in our time of need. He also assisted Iffy when Jacko was ill so Grant really is the rock we have come to rely on. You just know The Hoof will have been behind the Sunderland friendly and maybe even some loans besides………………. Grant was born in Sunderland in 1969 (he still has the accent and is almost as big a black cat fan as that mighty hoof that would rival a six-iron) and scouted by Leicester City, who signed the determined centre back at the age of 13. Grant made his debut in the middle of his A-levels and after 17 years in the game finished his career back in the classroom by taking his coaching badges. Grant only made 12 League & 2 league Cup appearances for the second division Foxes before Colin Murphy – a big mentor – rescued him from the reserves in 1988/89. Grant and Paul Groves joined the Imps on loan whilst protracted negotiations continued over a £150,000 deal for Tony James the other way. Grant and Paul made their debuts in a 0-1 League Cup defeat at Molineux against Wolves but Groves was then sent back after the month. Grant was retained for another month before he managed to twist John Reames arm to the tune of £63,000. A club record at the time we and ‘Murph’ had to have him so Mr Reames (RIP) – bless him – found the cash. Colin Murphy was the first of 11 managers for Grant at the Imps – some good and some bad – including the Chairman himself. Mr Reames reasoned one day that he would be cheaper and just as good as ex-players and the has-beens who had failed at other clubs. Hoof Grant was an immense ever-present figure at the heart of our defence and the first name on the team sheet for 12 years. He certainly traded the red and White stripes of Sunderland for those of Impdom and should you ever hear him talk to our youngsters you can tell he has Imp blood coursing through those Geordie veins. Every side he sends out understand what Lincoln City is all about – walk up the posh stairs to sign your first contract and a life size picture of grant is on the wall. Respect goes a long way to building a reputation, the old fashioned values will never die. In 1999/2000 with the debt time bomb ticking , Grant overtook Tony Emery’s appearance record of 424 League and cup games in an LDV Vans Trophy game against Morecambe in the November. He then broke his leg at home toHullwhich kept him out for nine-months so we had to wait a while for him to break the 403 League Games record (again held by Emery). It finally came on Tuesday 26th March 2002 in the derby against York at Bootham Crescent. Grant would make just 4 more appearance before being released. He would part company with his beloved Imps on a very sad note as we tottered towards the dreaded administration. Grant was offered a one year deal with Telford, followed by a two year, again near ever present stint at Alfreton (83 aps 1 goal). John Schofield, upon being given the managers job with John Deehan, insisted that Grant was the man to take over and nurture his babes. Grant, a man of his word, explained things to Worksop who released him – perhaps on the grounds of compassion, love or insanity – from one year deal he had just signed. This allowed him to play part-time for Grantham to make up his money, because Grant has always put the interests of Lincoln before the cash. Grant took over the first team reigns when Schoey and Deehan were sacked, before Jacko and Iffy took over. He then assisted Iffy Onuora during Jacko’s illness with Tom Spall running the youth set up. Upon Jackson’s return Simon Clark became first team coach, casting a doubt over his future. In July 2009 he was promoted to Assistant Head of Youth, taking over the head of Youth job when Tom Spall and Simon Clark took over after the sackings of Iffy and Jacko. Grant took over as caretaker manager for a second period on 10 October 2011 after Tilson got the boot. Having handed he keys to the managers door over to Reg October 2011 he got them back in 2013 until Simmo joined. Even though Grant wanted the full job on two occasions he has never once looked elsewhere. Hoof is as loyal as they come and an outstanding servant of our football club. Peter Jackson (Huddersfield Town & Bradford City) and Gary Simpson (Macclesfield Town) have endured harrowing experiences, to say the least, yet their optimism and appetite for the game has few equals. Both these Yorkshiremen have sent a wave of optimism through Lincolnshire that is so breath-taking there should be a picture of them both in the dictionary under the word Positive. Will we Imps doctor the song that rang round the McAlpine Stadium – “Who needs Mourinho, when we’ve got Jacko! (Simmo)?”, and hope Gary can go one better than the man, the more optimistic Imps, christened the Lord of The Imps? No one should ever go to a game never to return home. Jacko however played in the Bradford fire match, when 56 fans lost their lives (54 Bantams and 2 Imps) and did just that as Championship celebration turned to tragedy in minutes. Peter helped to ferry the fans from the stands and has also survived throat cancer. His inspirational, unique, motivational skills, at the heart of the post admin Huddersfield side of 2003/4 saw him defeat the Imps over two legs, before going on to beat Mansfield Town on penalties. The following season the Terriers finished 9th as he was relieved of his position. At Lincoln he overcame some bitter views from some due to an offside goal, then ensured we were safe before taking his medicine, on the way to beating cancer. His wave of optimism and, the signing of the magnificent seven, lit up the Imp City even though, Villa friendly and a superb October apart, we failed to deliver. 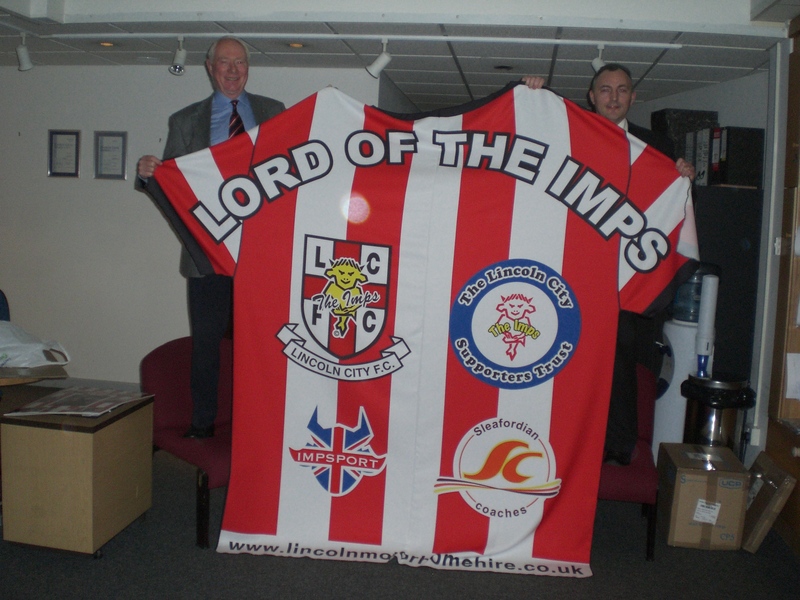 But what a man, worthy of the giant Lord Of The Imps shirt, funded by fans and Mark Broughton at Sleafordian Coaches, who disapointed many, yet in truth he was guilty of no more than showing Imps we should dare to dream. Jacko, part showman, part Uncle-style-figure to younger fans, was and is an all round decent human being, who ironically made Richard Butcher his first summer signing in 2009. The Impression he made on my lad and doubtless many others, went way beyond any superficial football requirement. So often fickle fans remember the bad form, but Jacko is a good egg. Gary has the same effect, although his aura is more laid back, more homely and humble. It is tough to lose two so close to you, namely the premature deaths of Keith Alexander and Richard Butcher. One was a mentor, both were massive mates. KA & Butch had shared his happy times at Lincoln, before the fates had intervened to end a positive post admin period for the Imps, that would then end in double tragedy for the trio in just 12 months at Macclesfield. But on the smallest budget in the League Gary (and Vice-Chair Andy Scott – oh for him at Lincoln), fashioned the inner personal pain into a galvanising positive force that avoided relegation and then kicked on. Player sales and injuries apart he might not have got the job he has always wanted. Like Jacko, Gary Simpson lights up any room he enters, particularly dressing rooms. Simmo’s edge over Jacko, perhaps since PJ lost Yorath’s services, is tactical, his positivity extends beyond blowing smoke up the right players backside at vital times, because of his ability at the all important training ground. For Jacko, Yorath’s tragic path was perhaps an obstacle too far for a man aptly involved in the care industry, near back-from-the-dead FC Halifax, the team he finished his playing career at under their previous guise. How many of us like Mondays? Yet Gary bounds in, win lose or draw. Don’t look back in anger, look forward and be prepared for the next challenge. Positive mental attitude, may be the term for the consultants, but in football, putting a bad run behind you, or continuing a winning sequence is, as much about kidology as it is belief. In football things are so fluid that the goalposts move with an alarming degree that shakes a managers credibility with both players and fans. Win 6 you are a god, lose 6 and you are clueless, with those left out turning the barrel faster than a bad apple during a heatwave. Simmo achieved this after the Holdsworth era, one of inconsistency, unprecedented player changes and a run that would undoubtedly lead to the BSN and financial ruin for the Imps. He shielded the players, gave them a clean slate and ‘wised them up’. More than just the tricks of the trade, he personally scouts the opposition and funds permitting, as at Macc, he would pay into a scouting service that costs very little (4 figures a year, if that). Player always knew their job, but more importantly, what was also realistically expected of them in the face of superior opposition. Rock, paper, scissors in the face of superior pace, technique, strength, but, in all fairness rarely height inferiority. The waves of optimism at Lincoln are long overdue But let us hope he gets a little more bonhomie than that enjoyed by Peter Jackson. Jacko had not fully recharged, got some bad luck and the fickle fans turned, using the hype against him to quickly pop the bubble. Our current manager will be mindful that fans memories are short, but unlike Jacko he will come back fully recharged. He is also fuelled by unfinished business and a desire to see the fruition of a dream forged in happy times, that two of his kindred spirits can only look down upon nowadays. The Imps had no money then, but we had a camaraderie second to none that took all by surprise as we surged to the play-offs at Cardiff. Belief is an incredible thing. It sustains, it inspires and it teaches us to smile through the adversity. Those who aim high may fail to touch the sky, but they have a better time of things and will always do better than those who expect the seeds to germinate with the first watering or do not even try. Bill Anderson & Lincoln City Managers 1947-72. Bill Anderson spent 19 years at the club and with 2 grand built a team that would go on to spend 9 years of the fabulous fifties in what is now the Championship. Cross yourselves Imps for this lad lived but a stones throw from the ground in a club house a million miles from Branston Hall’s opulence and he returned us from the dead one season with just a heater and its cinders for inspiration warmth and comfort. He was the man, the godfather of the ‘clan’. You have to feel he edges Colin Murphy or even Graham Taylor for the title of Lord of The Imps. Hailing from the North East footballing hotbed, Bill was simply immense, cobbling together side after side and ensuring the G-Force (Graver and Graver scored for fun in those fabulous fifties. A heady heyday with nine years of Championship (then Division Two) football, as the mighty Imps stood toe to toe with the big boys. Forget Dell Boy, or any cockney charmer, Bill could wheel and deal with the best of them. With our budget, as ever, he would need to. He was given the manager’s job in July 1947 after Joe McClelland’s unspectacular stint came to a ‘mutual’ end. Jackpot! Bill cobbled together two grand and built a title winning side to win the 3rd Division North. The heady heights of Division 2 lasted but a season as we were relegated, after the side was sold off around him. He vowed a return within 3 years and delivered, at the Cods expence 3 points off a staggering pace. Bill was true to his word and some in that 51/52 season. We netted 121 goals with five grand (the fee not the wage!) Graver getting 36 goals, Jonnie Garvie 21 and bow legged Ernie Whittle 20. We would hold our heads high until the sisxties including the great escape of 1957-58: when Lincoln produced the most dramatic escape from relegation in League history winning our last 6 games. Bill defied gravity until 1960-61 when the financially impossible dream ended as we went down bottom. The following year the same thing happened as the financial position worsened and we were relegated to the Fourth Division, though Bill stayed on in the job until retirement in 1965. Bill Anderson was our longest serving manager from Jul 1947-Jan 1965 overseeing 762 League games, winning 276, drawing 168, losing 318 and enjoying a win rate of 36%. How we stayed in business then was down to saviour Heneage Dove and the great Imp above. You would think Bob’s Chris Sutton decision was a strange one, well a man, not the beer; called Moulson was the shock choice to be the club’s new manager. Despite the ex player, named Con, being 58 and having no day-to-day involvement in football for almost three decades, he was given the job and literally rode in from Ruston’s on his bike. The 3-3-4 formation was revolutionary, but after only eight matches, all defeats, and 21 goals conceded, Moulson was given a part time job as kit man and resumed work at the factory where taking out his frustrations on metal plates. We`ll leave the stats as this is one 100% record no one wants brought up. The Imps then hired a famous ex striker by the name of David Herd who would last just over two seasons despite having a reasonable record (Mar 1971-Dec 1972 P 82 W 30 D 30 L 22 win %age 36.6). So this bodes well for Chris Sutton, well hushed up scandal apart anyway. We would then move on to another untried expro The one the only GT – Graham Taylor OBE. And Heneage Dove hired him and backed him during those tricky early days. When Lincoln joined, Grimsby Town, Boston United and Gainsborough Trinity in the non-league abyss it left just Scunthorpe keeping up the yellow-belly end of things in the football league. Such a shame that the Imp, one of the founder members of Division Two (the Championship) should leave the league again. But then we have had some terrific managers since John Henry Strawson took on the job. That was straight after the cavaliers that met at the Monson Arms on the High Street in the Summer of 1884, dared to dream. And no one has come back as many times as us. During the course of our history the Imps have had 43 managers in one variation or another. Seven have been caretakers and eight held the post of Secretary-Manager, a curious job & title that saw the day to day running of the clubs administration combined with the organisation and training of the team only. The Directors would then pick the team and hire and fire (8 lads walked the Bank plank after a cup exit against the cods in 1885) accordingly with the Secretary having just the one vote in the selection process. Our first manager Joe McClelland, appointed in 1936, still had to submit his team to the directors for approval, but with a 43% win rate they tended to trust his judgement if he was buying at the Monson Arms (building is still there corner of Monson & Hight St). Our first secretary manager, John Henry Strawson, who also played for us in our first season, had two spells at the club. His first between 1884 and 1896 saw indifferent form, not surprising given he had all the balls in the air. He did the books found and trained the players and was even instrumental in building the ground and organising the move to Sincil Bank to celebrate us getting in as founder members of the second division. His second spell (1907-19) also saw him wield some magic as he continually kept us in the League by doing deals to ensure we won re-election meetings time and again. Strawson`s eloquence was renowned; perhaps we owe our very existence today to John who ensured we did not waste away like so many sides in those early formative days of football. The Football League rewarded him with a long service record in 1919, noting that he had even refereed for 7 years between 1888 and 1905. He also returned after the defection of David Calderhead Senior to Chelsea in 1907 after we had impressed in an FA Cup tie at Stamford Bridge. David`s son would also manage us in yet another time of turbulence after World War 1. 47.34% of his games. After being relegated two years after our triumph he was given a further two years at the helm before leaving for an ill fated season at Mansfield and two at County. McClelland then became Lincoln`s first true manager after an impressive spell at Halifax. He had been their first manager too, literally. He was present at the formation of the club in 1911 and even chipped in part of the £1 to incorporate it. He took them from the Yorkshire Combination League to the Football League and even layed the first turf at their Shay stadium. He left in 1930 and spent 6 years away from the game, until The Imps re ignited his passion for the game. Joe`s impact at Lincoln was solid though unspectacular and blighted by the Second World War. Joining in June 1936 his third season would be interrupted by the outbreak of the conflict, though he did run the interwar side and his record was a solid one. Under Joe The Imps played 168 Games, won 73, drew 29 and lost 66 with a 43.45 % win rate. He would relinquish control in 1947 to be replaced by the greatest manager Lincoln City has ever had, Bill Anderson, perhaps the one true Lord Of The Imps. With no football and the snow halting Holdworth’s assault on the upper regions of the Blue Square abyss, how about a look at the managers he is trying to emulate? And for sure those we most sincerely hope he will surpass. ‘S’ denotes the status of ‘Secretary Manager’, one who organised all but the team selection. This essential task was undertaken by non other than the Board of Directors . Harry Parkes just edges (bow please) the great Bill Anderson in percentage win terms. Bill has the most wins – 307 – as he took us to the second Division and a golden era where we punched above our weight. That is the Imp way after all.